Ingersley is in Rainow parish. However, it is physically very much part of Bollington and what happens to Ingersley Vale is of acute interest to Bollington. The Bollington /Rainow boundary crosses Ingersley Road beside the Poacher’s Inn at Mill Lane. Sowcar farm across the road is in Rainow as is the cottage on the corner. The boundary runs along Mill Lane, the bridle road beside the Poacher’s, then across to the Bollington side of the bowling green, across the mill pond and straight up Kerridge Hill, then all the way along the top. This means that the major part of Ingersley Vale is actually in Rainow. Ingersley Vale is interesting for its heritage. Opposite the bowling green is a fine old stone house. On another side of the green, on Mill Lane, is a row of stone cottages, all beautifully restored. There is no road access from Ingersley Vale to Rainow, just a very good footpath. Along Ingersley Vale, beyond Mill Lane, is the green corrugated iron workshop with another business behind that. On this site once stood Rainow Mill, from at least 1611 (and possibly much earlier) a corn mill, later a paper mill, then a cotton mill, a silk mill and finally back to cotton. It was probably re-built several times over the centuries, including after a major fire in 1856, before finally being burnt to the ground in 1908. Lack of proper insurance ensured that it was never rebuilt after that. The mill pond was located immediately behind the mill, above the weir, where the level wate ground is today. 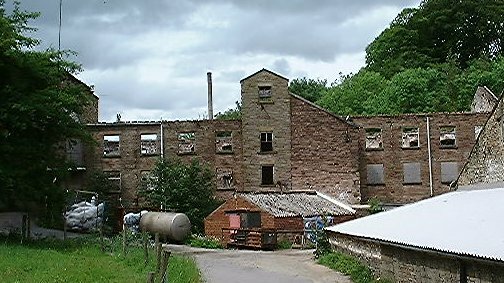 The next premises up the valley is Ingersley Vale Mill, usually referred to today simply as Ingersley Mill. The original building was seriously damaged by fire in November 1999. The remains and the preservation of this listed structure are presently a major concern and ideas were proposed in the 2002 Kerridge Ridge & Ingersley Vale Heritage & Countryside Project (KRIV). The mill is located across the narrowest part of the steep sided vale, being only about 150 feet across. A huge wheel house adjoins the mill – the block behind the tree on the left in the picture above. A very narrow lane, clinging to the hillside, passes the mill and provides access to properties further up the vale. A large number of very poorly constructed 1960s industrial buildings adjoined the mill on both sides up and down the vale. These have now all been demolished in preparation for a housing development that never happened. There was also the remains of older out buildings – behind the mill one looked as though it might have been the Apprentice House that is known to have been built on the site. A part of the building on the extreme right of the picture is the warehouse built in the 19thC on the location of much earlier mill workers cottages and the mill manager’s house, all now gone. The water wheel at Ingersley Mill was fed by a leat from Ingersley Clough pool. All remains to be seen today. The leat is connected to the mill by the aqueduct across the lane beside the wheel house. If you walk along the lane you will see the leat at the top of the field. At the end of the field it emerges from a culvert that carries the water beneath the cottage gardens. Walk up the lane past the cottages and you will find Waulk Mill House and Waulk Mill Farm on your left. Opposite them is the most excellent waterfall over the dam that retains the clough pool. The pool is very overgrown these days and contains a relatively small amount of water. The pool is now in private ownership and the owners have made great efforts to manage the site and encourage all forms of nature. The waterwheel at the mill evolved with time. It was originally two wheels, one above the other. Later these were replaced with a single wheel, rather like a gigantic spoked bicycle wheel, about 52 feet in diameter and 10ft 6 inches wide. This made it second only in size to the Laxey wheel in the Isle of Man. The wheel was later replaced by turbines connected to electricity generators. This mill was one of the very first in the country to be electrically powered. Nothing remains of this mill, which was part of the woollen industry. The name remains in the properties at the southern end of Ingersley Vale. It is thought that the mill may have been located in the flat riverside field below the present cottages. I am indebted to leading local historian George Longden for much of the above information. George has undertaken a remarkable amount of research in Bollington, its origins, industry and people, and has, sometimes with others, published a number of extremely interesting books about the history of the town and surrounding area. Checkout the Books page where you will find his reference list.